“Must-Dos” once Mercury Retrograde is Over. There are some really positive things you can do to re-take control of your life and correct any mistakes you made during this last retrograde period. For starters, take a deep breath and assess what you have learned. You are now ready to make some important decisions based on what you know now—that you didn’t know weeks ago. This is the perfect time to resolve any miscommunications or arguments you’ve had with friends or loved ones. Search for any lost items, because you are likely to find them now. It’s safe to make plans to go on a great vacation where you can have fun instead of frustration. However, one of the biggest problems that occurs for people during the retrograde is their tendency to miscommunicate—and as a result, create upsets in their relationships with others. 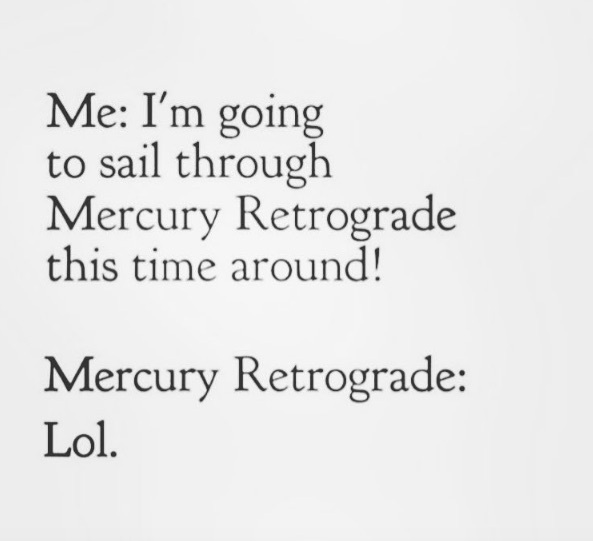 Now that Mercury is direct, you can clean up some of the communication mistakes you may have made during the last three weeks of the retrograde. 2. Own up to any other lies you told. Here are some examples of lies that were told during this retrograde. If you own a laundry: “Your shirts will be ready on Tuesday.” If you’re with a drinking buddy: “This is my last beer,” or “I’ll give you back the 100 dollars you loaned me next week.” If you’re a car salesperson: “It’s supposed to make that noise. Who knew that used car would turn into a lemon after I sold it to you.” If you’re talking to a police officer: “Drinking? Why, no, Officer. Smoking? I never inhaled.” Everyone knows that during the retrograde communication cannot be relied upon. So, of course, it’s not your fault if the other person actually believed you in the first place. But contrition is good for the soul. 3. Acknowledge that your impatience nearly created a car accident. Your road rage is forgiven because everyone is impatient during the retrograde, and it’s so easy for the other person to misinterpret your actions. Case in point: you had no idea that the burly guy driving that big semi-cement truck would misinterpret your finger wave as an obscene gesture. You were just innocently scratching your nose with your middle finger. It was hard to hear what he was yelling when he attempted to push your car off the side of the road, but it was something about your mother. 5. Confess that you accidentally lost your girlfriend’s yappy dog. Everyone knows that the retrograde is a time when things are lost because people are mistake-prone and not thinking clearly. This is the perfect explanation for why you left the gate open, and your girlfriend’s dog ran away. It’s also been a fabulous opportunity to be rid of a miserable mutt who peed on the backseat of your new Porsche 918 Spyder, which you love more than life itself. Unfortunately, the dog will come back now that Mercury is direct (hopefully with a greater respect for German carmakers). 6. Apologize for the mean thing you said about your mother-in-law. Everyone knows that this was a time when people tend to make mistakes in their communications and accidentally say things they don’t really mean. Case in point: you were talking to your wife and trying to express how much you enjoy her mother’s vast intellectual curiosity about your marriage. However, because of Mercury retrograde, somehow your words came out as, “Your mother-in-law is a nosy b*tch!” It’s been three weeks, and hopefully, your wife is now ready to move back home with the children. Relax. 7. Explain why you forgot your wedding anniversary. Everyone knows that during the retrograde a person’s mental faculties are not operating at 100 percent. Anyone can forget a golden anniversary. If you want to know if you were born during Mercury retrograde, enter your birth date in the Free Transit Calculator. It will compute your personal transits for 2018 and the planets in your birth chart. Then, make sure to scroll down to the bottom of the page, where you will see the sign your Mercury is in. If you see an “r” you were born during the retrograde. If you want to know about the planets in your personal horoscope, go to the Free Horoscope Calculator and enter your birth date. If you’re curious to learn what your horoscope says about your love relationships and marriage prospects, as well as career, investments, and health, order your customized personal report.